at the beach the real deal. 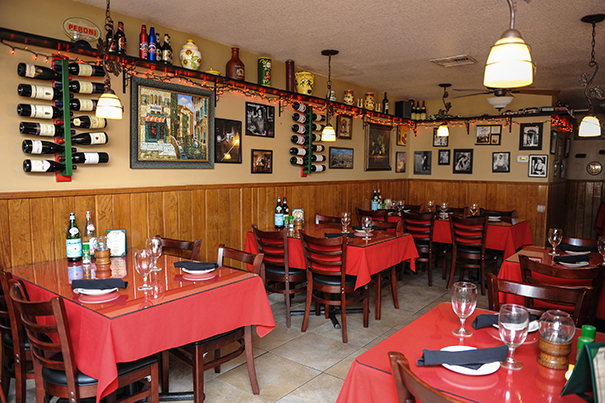 La Strada’s extensive wine list also boasts superlatives— the largest selection of Italian varietals and blends in St. Augustine. Pan-seared sea bass is a succulent specialty of the house. 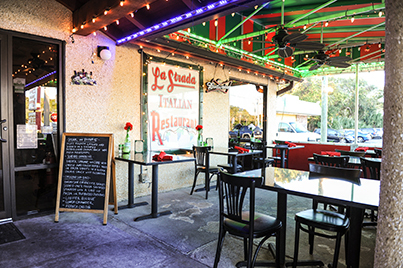 La Strada, opened in July of 2002 by Chef-owner Mark DeRusso, is a reflection in every way of his Italian-American heritage and his many personal passions—from the New York Mets baseball team to one of his favorite films, The Godfather, to legendary Italian-American singers like Frank Sinatra. Memorabilia, movie stills, paintings of famous Italian destinations and tributes to the city that never sleeps are part of the decor while the music selection favors vintage Rat Pack ballads and jazzy hits from the 1950s and 60s. As a native New Yorker, Chef DeRusso has brought a flavor of his background to every corner of the restaurant. And, speaking of flavor, bold flavor defines the menu and cuisine at La Strada. “Italian cooks are relentless in the pursuit of the best ingredients, and I take keeping that tradition alive in my own restaurant very seriously,” he comments. Chef DeRusso sources fresh local seafood, freshly grown produce and herbs and handcrafts all sauces to make outstanding Italian standards (from Chicken Marsala to Veal Parmigiana) as well as specialties of the house that are uniquely his. A graduate of the Hudson County Culinary Institute in Jersey City, N.J., Chef DeRusso honed his cooking skills at several restaurants in the Tri-State area before moving to St. Augustine where he distinguished himself as executive chef of Aruanno’s, a popular Italian restaurant in St. Augustine beach that operated from the mid 1980s till 2004. In 2000, Chef DeRusso took the plunge into restaurant ownership and opened the doors at La Strada. Located in St. Augustine Beach, Chef DeRusso created the kind of restaurant he himself would like to go to—the neighborhood Italian restaurant of his memories. Classic Italian-American specialties such as baked pasta dishes and beefy lasagna, sautéed chicken and veal scallopini dishes, and good old spaghetti with homemade Italian meatballs stir the memory. But Chef DeRusso extends far beyond the expected Italian-American fare. Wild mushroom ravioli are tossed with brandy cream sauce and topped with oven roasted tomatoes. Lobster ravioli are served in a light tomato cream sauce with oven roasted tomatoes and a grating of Romano cheese. Tortellini filled with delicately seasoned and minced veal are tossed with prosciutto, sliced mushrooms and delicate spring peas in a tomato cream sauce. Linguine with classic red or white clam sauce is always on the menu for those who love it but, when it comes to seafood and pasta combinations, Chef DeRusso sets himself apart from every other restaurant in town with his presentation and authentic flavors. His Frutti di Mare pasta dishes, brimming with a selection of fresh shellfish, calamari, shrimp and lobster tails, are nothing short of spectacular, capturing the attention of everyone in the dining room. And, if the eyes don’t have it, the nose does when Chef DeRusso’s garlicky Shrimp Scampi, using extra large locally caught shrimp, is paraded through the dining room. Meat cookery is a passion for Chef DeRusso, and he is proud to boast the largest selection of steaks in St. Augustine Beach including Porterhouse, T-bone, New York Strip, Filet Mignon and Top Sirloin steaks grilled to order. In addition, specialties of the house include a 14-ounce rack of New Zealand lamb with a Dijon-herb crust and Duck a La Strada, a half roasted duckling in a signature cranberry-port wine sauce. From housemade soups to delectable desserts, La Strada’s food and ambiance create the perfect repast that may, like me, remind you of the past. And it is an experience that you will definitely want to repeat again and again! 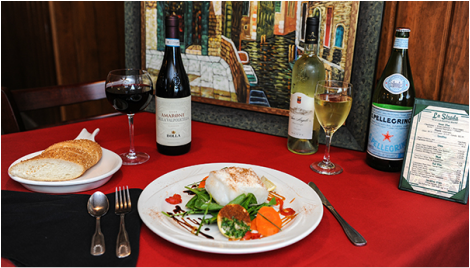 La Strada serves dinner nightly with Early Bird Dinners and Happy Hour drink specials offered from 4-6 p.m. Reservations recommended. Chef-owner Mark DeRusso’s colorful decor reflects his love for the New York Mets, New York City and Italian-American culture. Dining alfresco is a way of life in Italy and in St. Augustine is often a year-round option as well. Offering the best selection of steaks on the beach, Chef DeRusso prepares Porterhouse, T-bone, New York Strip Steaks, Filet Migon and Top Sirloin to order with signature accompaniments.